Behold the destructive majesty of Tembo! 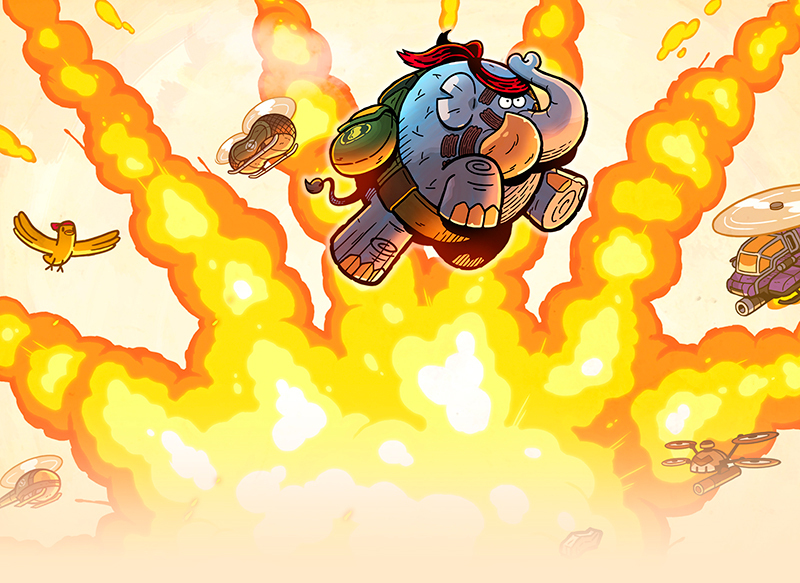 Tembo the Badass Elephant is a side-scrolling platformer in which you play as the titular Rambo-themed pachyderm. 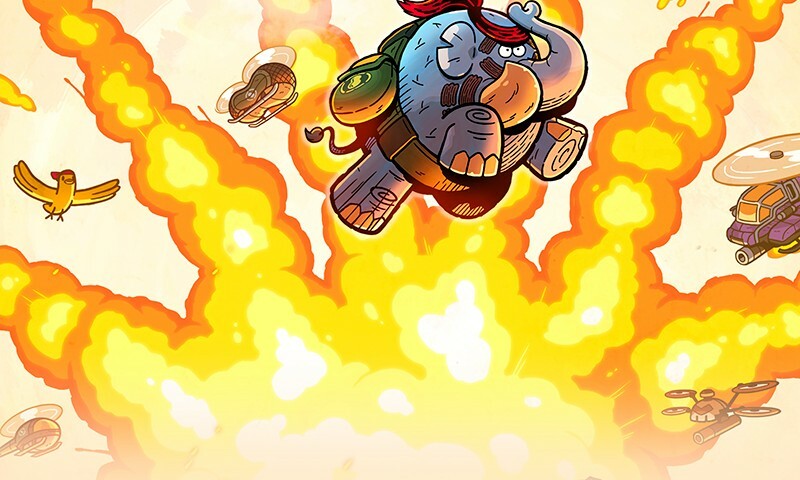 Tembo dashes and brawls his way through the invading Phantom Army, collecting peanuts, accruing points for enemy destruction, putting out fires and rescuing hostages. 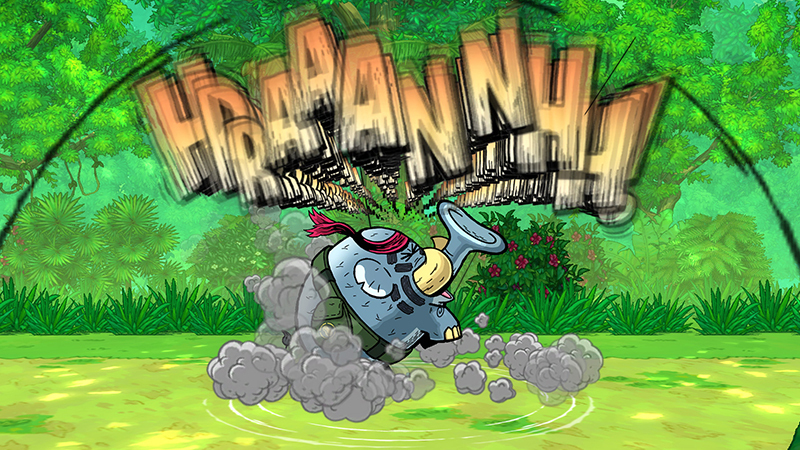 The tongue-in-cheek concept of a modern-era war elephant is established and only sparsely developed through some brief but expressive comic book–style cutscenes. Visually, Tembo is a very attractive game. It’s colorful and cartoony; it’s full of destructible objects with physics, comic book onomatopoeias in the air (like Tembo’s running sound, which goes Bada-Bada-Bada), and it all looks great in motion. Not only are the three worlds varied, each individual stage within is visually distinct, with its own theme: Now you’re on a speeding train, now a city block, now an underground lair, now mountainous countryside. Tembo’s visual flair and level variety belie what is ultimately a surprisingly straightforward action platformer: Destroy enemies for points to open the next level, rescue hostages for completionist bragging rights, and make it to the end of the stage alive. It doesn’t feel lacking in features, however—it feels stripped of baggage. Tembo doesn’t really learn things or unlock things along his journey. There are no new powers, weapons or abilities—levels just get harder and harder. Tembo borrows heavily from games like Donkey Kong Country, but it’s really (ex) Sonic fans who should perk up their little blue ears at the sound of Tembo Bada-Bada-Bada-ing toward them, for here is a game that knows what aspects of its lineage are worth holding on to—which parts of the lumbering beast we call Nostalgia will sustain us through the next cold winter, and which parts should be left as carrion for scavenger animals. It’s retro platforming action done smartly. 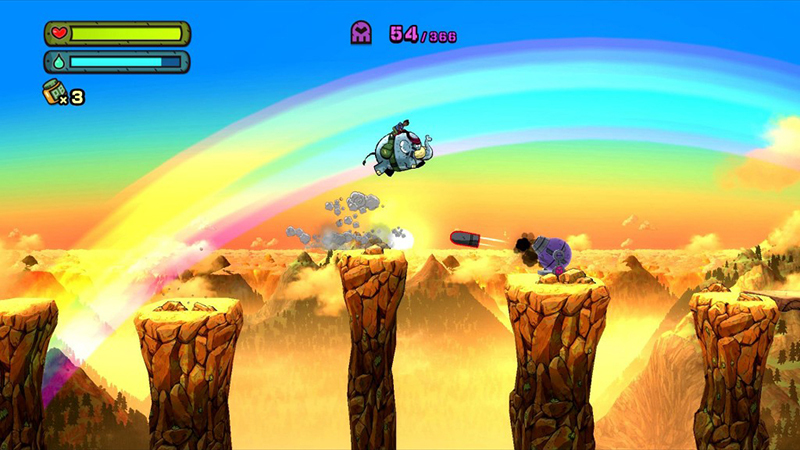 Tembo’s high-flying platforming is quite visually distinctive. The pace of the platforming is much more Sonic and Donkey Kong than Rayman or Mario. Tembo moves extremely slowly unless you dash, so you end up dashing as frequently as you can. He even balls up like the blue hedgehog and gets shot out of cannons like Donkey out of his barrels. This fast-paced platforming is combined with a deceptively challenging melee combat system. Tembo’s dash can one-shot most smaller enemies, so you’ll run right through them, but many later enemies require carefully timed ducks, jumps and slides underneath. By about half way through the game, enemies are often arranged in some tricky configurations, requiring either slow and careful patience, or some split-second, skillful timing. An unfortunate result of this combination of speedy platforming and tricky combat is that Tembo tends to have a pretty jarring flow in places—a problem that becomes more obvious the further you progress through the game. I had to teach myself to always be ready to come to a dead stop at any time. Often, the consequence for rushing in is a quick death. This felt strange and inconsistent within a game where dashing is a big part of the fun, and is explicitly encouraged by the level design. Am I just too slow and stupid to pull off the precision attacks and timed rolls and dashes that would allow me to maintain momentum and crush my enemies at the same time? Yes, I think I am too stupid and slow for that—because it surely seems possible to do. I think speed runs of Tembo levels will have insanely short runtimes if someone with the right skills practices long enough. That person is not me. However, I am almost certainly average at platformers, vis-à-vis the rest of the console-gaming public, which means that Tembo the Badass Elephant, despite all appearances, is a surprisingly difficult game. I became stuck on more than one occasion—like, really stuck. Tembo the Badass Elephant is a tough game, occasionally leading players to outbursts of frustration. So it’s a bit hard for my taste, and I wouldn’t recommend it to a child as readily as, say, a Mario or Sonic game, but Tembo’s platforming mechanics and overall gameplay are solid, fast, challenging and responsive. The real problem (and the reason I got so stuck in the game) comes, I believe, from a disappointing lack of content. You are locked out of the fourth stage in each world until you have enough of the purple destruction points saved up from previous levels—but the amount required to proceed is surprisingly close to the combined total amount of points each stage contains, meaning that the game essentially forces you to come far too close to 100 percent completion on every previous level before it deigns to unlock the next one. When I was locked out of a new stage, I found myself farming other stages for a max score, and eventually, I hit a wall where I wasn’t getting any better, I couldn’t beat my current highs, and I still didn’t have enough to open a new stage. And it was at this point that I began to get bored. And I do think the game’s lack of content is the reason for this strict stage-unlocking feature. I can’t be sure because, as of this writing, I am still stuck, but it appears that there are only 12 stages total in the game, plus three boss fights. Without the points-based lockout forcing you to replay previous stages, Tembo could be easily completed in an afternoon, and the lockout is an artificial way to hide that fact and to lengthen playtime. Considering each stage’s brief length, 12 stages is weirdly short for an action platforming game. For me, it would probably need twice that many to not feel truncated (Get it?! Trunk-ated?). It’s a shame, too, because what’s there is plenty of fun. For its pricetag of $15.00, however, there is almost certainly a decent-sized niche of platform lovers that’d feel they got their money’s worth.